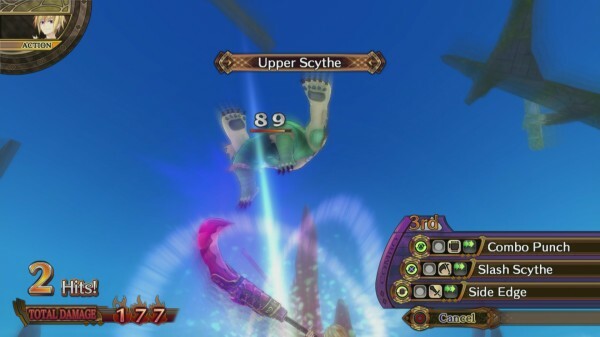 When Compile Heart announced the Galapagos label for RPGs, many of their Western fans grew concerned that these titles which would be developed specifically with the Japanese style and audience in mind wouldn’t make it overseas. 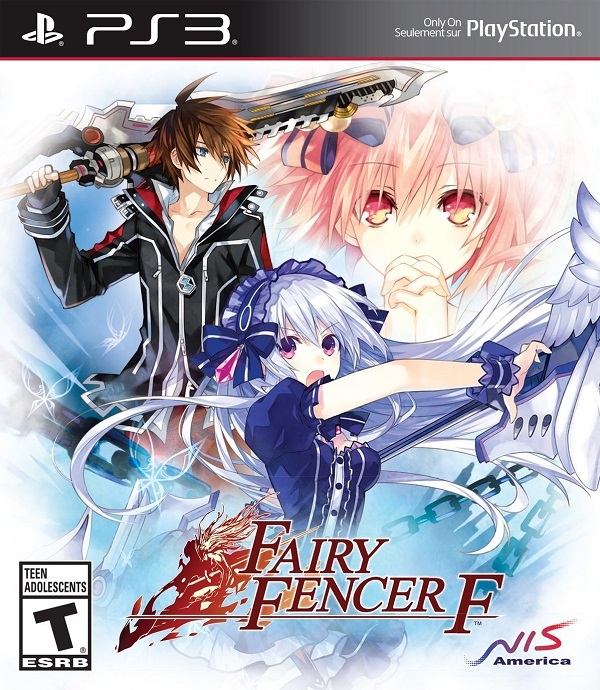 Those concerns turned out to be unfounded as the first game under this label, Fairy Fencer F, made its way to the West through NIS America. The question is, does this first game offer a worthwhile experience? Many years before the start of the game, the Goddess fought against the Vile God in a battle for the world. By using furies to attack one another, the battle between the two ended in a draw that saw both being sealed away in another dimension. However with the final barrage of attacks, many of the furies used in the battle missed their target and fell to the world below, where they lay waiting for worthy wielders to appear. What makes a user worthy seems to be entirely up in the air however, as the protagonist of Fairy Fencer F happens to be a man named Fang who would rather spend time sleeping and eating free food inside of a jail cell than bother with saving the world. With selfish desires, Fang yanks a sword said to grant wishes from the ground and finds that he has now been paired up with a fairy named Eryn who has made him a Fencer. With Eryn suffering from amnesia, Fang learns the true nature of the furies and the status of the Goddess and Vile God from a woman who appears to know more than she lets on. After initially poisoning him and becoming an ally, the two Fencers and their fairy partners begin their journey in order to track down all of the missing furies in an effort to release the Goddess from her seal. Despite having a solid enough foundation, Fairy Fencer F story falls short on execution. The game might feature some worthwhile humor and the characters really help make the game what it is, the way that the storyline is handled is really too simplistic. Although a few twists are thrown in here and there, you are given very little reason to care about the world as it is so poorly developed and the slow development of the story doesn’t help things. It also doesn’t help that while the humor can be funny at times, especially when it breaks the fourth wall and references JRPG tropes, it falls short of many other Compile Heart offerings. 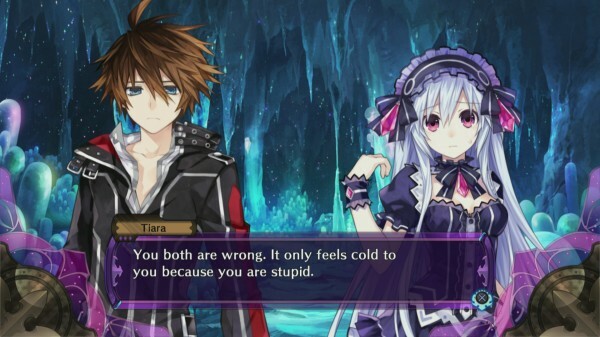 Along those same lines the characters found within Fairy Fencer F also lack a certain spark. While their interactions with one another are quite humorous at times, it feels like none of the characters really stand out in any special way and the drastic tone shifts that occur throughout the story can cause the humor to fall flat at times. 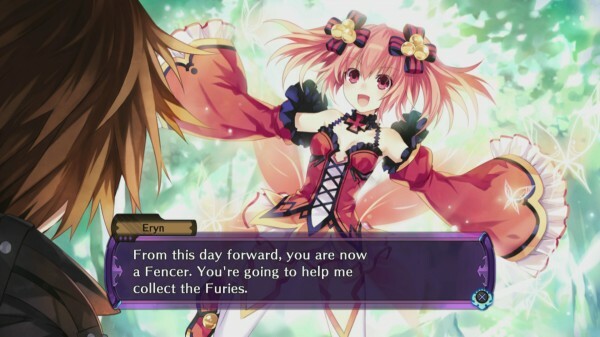 If you have followed Fairy Fencer F at all, you may have noticed that there are many aspects of the game that look like they were taken from Compile Heart’s other franchise, Hyperdimension Neptunia and in the end you would be mostly correct, even stat boosts from completing in-game challenges with characters have been included. 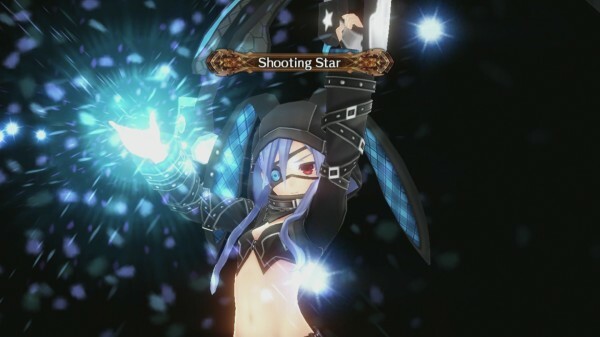 Although there are numerous similarities with that series, a few changes have been thrown in to make Fairy Fencer F unique. As players progress through the story they will learn the locations of lost furies and then travel to said location. These dungeons are all very similar to what one would expect from the Neptunia game series, as there are enemies roaming around, treasure gems to acquire, and an occasional save point. If you happen to perform a “symbol attack” and strike the enemy before they reach you, the player will be given the first turn in combat or if you happen to miss or let an enemy run into you, they will ambush your party. Once in battle a very simplistic but refined turn based combat system is used. Every turn the player is able to move a certain distance on the battlefield where they can choose to attack, use a skill or an item, defend, or “Fairize.” While many attacks can only target a single opponent, some skills allow the player to target every enemy in a certain area and being able to use the L1 and R1 buttons to slowly adjust this area can be crucial at times. Basic attacking is handled in a straightforward enough manner, with players being able to use combo attacks once they unlock them by gaining levels and applying “Weapon Points” to their combo meter. 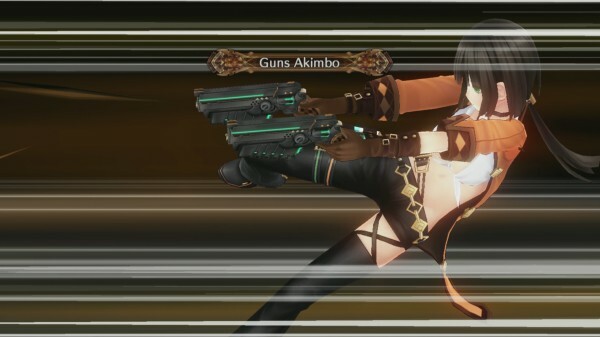 These weapon points can also be used to raise various stats, unlock skills, or different combo moves. 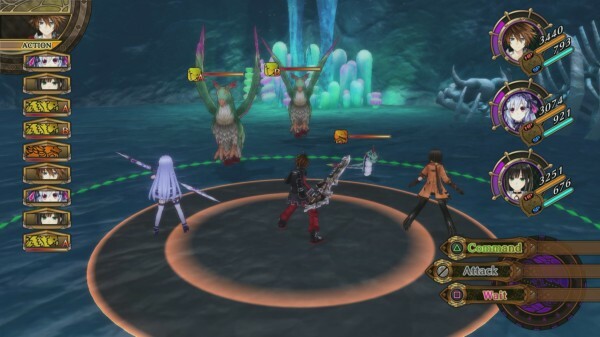 Players can actually swap their weapon type in mid-combo, which is useful because enemies in Fairy Fencer F are not only weak to certain element types, but also weapon types as well. If you happen to trigger a critical or target a weakness, you can even perform what the game calls an “Avalanche Combo” that allows your other party members to deliver some extra punishment before their turn. Throughout the battle a “battle tension” gauge will fill up next to each fighter’s name. Once this gauge reaches a certain point the player can enter the aforementioned “Fairize” phase. More restrictive than CPU forms, Fairize boosts the player’s stats and unlocks certain powerful skills, but there is a cost to using these moves. Not only does Fairize rely on the battle tension gauge, which raises when a character takes or dishes out damage, but can drop if you use items or healing skills. This meter depletes every turn the player remains in this state before ending close to the end of the gauge. This can be problematic because the lower the gauge, the less damage your attacks will do and the more damage you will receive from enemies. It also is worth noting that while the powerful Fairize abilities are nice finishing moves, they also require a large HP drain from the user, meaning that they can sometimes leave the player open for a possible KO if they misjudged their opponent. That being said, there were very few difficult moments in Fairy Fencer F and never once did I feel like there was a need to grind for levels or weapon points. This is partially due to the way weapon points can be distributed, as they allow the player to focus on bulldozing opponents before worrying about strategy most of the time. Occasionally a difficult battle would arise but any level of preparation would usually be enough to strike down that opponent. Outside of entering dungeons and battling, players can take on various side-quests that involve killing enemies or obtaining items from killed enemies, synthesize items with various ingredients, and of course, unsealing the Goddess and collecting furies. The various furies and their corresponding fairies can be equipped to enhance a character’s ability and provide passive upgrades. They can even be used to modify various elements of a dungeon through World Shaping, an intriguing idea that allows the player to temporarily remove a fairy from their collection and stab it into a dungeon area. This can have different effects depending on the skill, such as raising experience point gain by 30% while lowering the parties defense by 10%, giving the player some sort of variety if they do feel like grinding through the, sadly monotonous, dungeons. Fairy Fencer F isn’t the best looking game in the world but it does have its moments. Every dialogue scene features character portraits of the speaking characters and these portraits are nicely detailed and have a decent amount of reactions. The various CG scenes shown throughout the story are also quite a highlight, especially for those who enjoy themselves some fan-service, however everywhere else the game is a bit of a disappointment. The character models are bland compared to the portraits and the environments that the player must go through tend to be rather simplistic looking, following very standard themes that fans have grown used to at this point. It doesn’t help that the enemy models are just as bad and palette swapping becomes an issue early on. The only saving grace is that the various skills and Fairize transformations are impressive looking, though they do tend to cause some slowdown, especially in a busy battlefield. Generally most English speaking audiences prefer the new English dub over the original Japanese voice track, though both are included to offer the player a choice. While the English dub might work better for the comedic interactions between the characters, the flatness of some of the characters’ voices really takes away from the experience. There are instances that this completely kills the jokes and at least the Japanese voice track gives these characters a bit more personality. The background music throughout Fairy Fencer F is actually rather enjoyable. There are a number of tracks used throughout exploration and battle that are enjoyable to listen to, with the Fairize transformation song being my personal favorite, though the title does suffer from a few uninspired tracks that are used ad nauseam in main areas. 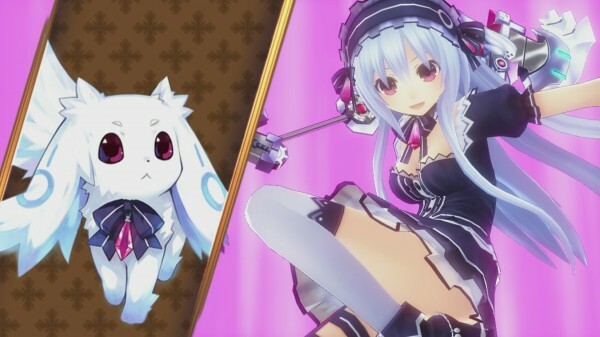 There are a few things in Fairy Fencer F that give the game some potential. It features a solidcombat system with enough variety to not grow tiresome, though it might be a bit easy for some, and an enjoyable cast of characters with some funny banter to keep things fresh. Unfortunately the title is lacking in charm and originality, making it difficult to really get stuck into the storyline, even once it does begin to pick up the pace later on. Those that do stick with it however will be treated to a darker story than what Compile Heart usually produces, which is a nice change of pace.